Adding hardwood flooring to your home can be a great investment, since most new homeowners are looking for the upgraded look and feel of hardwood floors. If you are planning to sell an existing home, hardwood floors will enhance the sales potential of your home. 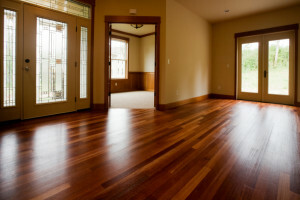 In most cases your home will sell much faster than a home that does not have hardwood flooring. Buyers appear to have a preference for hardwood flooring everywhere. Not only does it look great but it is long lasting and can withstand many years of use however hardwood flooring can be expensive. As an alternative to true hardwood, an engineered hardwood floor can be a great option for those who want the advantages of hardwood floor while spending less. Here is some information for those interested in engineered hardwood floor if you want to know what it is all about. Carpeting on the other hand begins to look tired even after a few years, especially if there is a lot of foot traffic on some areas. Stick to hardwood if you are buying a new home or upgrading and replacing your existing flooring. Engineered hardwood floors are made with an inner core of hardwood, high density fiberboard (HDF), or plywood and on top of this a layer of wood veneer is glued. The outer wood veneer layer can be found in almost every kind of hardwood species. This means you can have the same great look of all the varieties of hardwood flooring available. The outer veneer layer can come in varying thickness as well so you can find flooring that will be long lasting and will stand up to wear. A great advantage of engineered hardwood floor is that the inner core material is designed to allow greater stability. True hardwood floors are very sensitive to heat and moisture and can expand, contract and warp. This could lead to gaps forming or cupping of the boards among other things. So in essence you have the best of both worlds. The outer veneer layer is the same wood you would see in solid hardwood but the inner engineered core of engineered hardwood floor makes the flooring less sensitive to the effects of heat and water damage. One big disadvantage of an engineered hardwood floor is the number of times that the floor can be refinished. Basically when you refinished a floor, you are removing the top layer of varnish and some of the wood as well to get down to untreated hardwood. Since an engineered hardwood floor has a veneer it is limited in the number of times that you can refinish it. If you take good care of your floor, don’t allow shows to be warn on the floor and clean regularly, your floor will last for many years without the need to be sanded. consumers have been know to get as many as 20 years out of a floor before it needs to be refinished. For those people who are planing to sell their home the age, how ell it has been looked after and whether it needs to be refinished or not could be a potential negative for a buyer. If you plan to stay in your home for many years chances are that you will need to refinish the floor at some point and you will want to take this issue into account, before you make the decision to go with the engineered hardwood floor variety. An engineered hardwood floor is a great way to have the beauty and charm of hardwood flooring with less worry over the floor stability. Take the time to look further into the many advantages of this type of flooring. Talk to the experts and compare the advantages and disadvantages for your new hardwood flooring design. Are interested in installing hardwood flooring in your home? It is a good idea that you search many different suppliers, comparing quality and pricing. You can find everything you need with one hardwood floor provider. However you are taking a chance on paying too much. Some of the larger stores will have the largest inventories of hardwood flooring with great prices and quality. They have many different types of flooring available. They are often backed with a satisfaction guarantee. If you are not in a huge hurry, sometimes you can pick up sales. Sales can save you hundreds or thousands of dollars depending on quality and the size of the floor you are covering. Hardwood floors come in many different forms and varieties, each with their own benefits. Wood flooring may be unfinished or pre-finished. Most people settle for pre-finished flooring these days. The width of the floor boards can vary with strip, plank or parquet flooring. Also, there are a large number of wood species that can be used. Each kind of wood comes with its own characteristics and grades. We chose our flooring based on what we liked in terms of color, texture and the overall look that the floor would contribute to our home. To some extent we matched it to our existing decor as well. We did not want have to change many things in their home. The variation in flooring doesn’t end there as there are various cuts, finishes and recycled or reclaimed woods. There is a lot to consider when finding ideal flooring. However if you shop around you can usually find something that meets your requirements and will not break the bank. As an alternative to hardwood flooring, laminate flooring should be looked at. Laminate flooring is not true hardwood but is made from a dense fiberboard covered in a patterned paper layer under high pressure. You can tell the difference between laminate flooring and true hardwood flooring. The knots and grain patterns of the wood will be repetitive and this surface does not age in the same way as real wood. 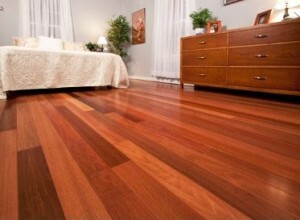 The advantages of laminate are essentially in cost and durability. Laminate is resistant to denting and stands up to high traffic areas. It is important to note that you generally cannot refinish laminate flooring in the same manner that you would refinish hardwood flooring. A relatively new style of floor you can find with many suppliers of hardwood floors is bamboo flooring. Bamboo is extremely strong, durable, dimensionally stable and environmentally friendly. It can be re-grown quickly with little fertilizer. You will find low prices on all of these flooring types at Lumber Liquidators hardwood floor. Many flooring companies will provide samples that you can take home and visualize what your new floor will look like. Sometimes even with a sample it is still really difficult to get a good idea of what the floor will look like once it is installed. In some cases the hardwood flooring store may be able to arrange for you to see another customers home with the same flooring. Many customers are more than happy to show off their homes when they have just acquired a new hardwood floor. If you are fortunate enough to be able to take advantage of an offer like this, always be very complimentary. Thank the owners for their time and allowing you to take a look inside their home. They are going out of their way to let you view the final results so it is the time to show your appreciation. One of the important things to do as well is to talk to your friends and colleagues who may be able to give you tips on buying hardwood flooring, pricing and installation. Readers are welcome to leave their comments about their experience with hardwood flooring to help our readers. For more details about hardwood floor selection, click here.